TREAT YOUR SKIN, MIND, BODY & SPIRIT WITH ROSE QUARTZ AND ACTIVATE YOUR HEART CHAKRA FOR SELF LOVE AND COMPASSION. 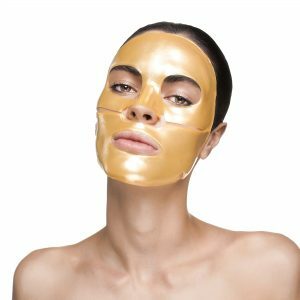 AREAS OF CONCERN: FREE RADICALS CAUSED BY ENVIRONMENTAL STRESSORS SUCH AS SMOG AND POLLUTION, FINES, WRINKLES, DRYNESS, UNEVEN SKIN TONE, DARK CIRCLES, FATIGUE. 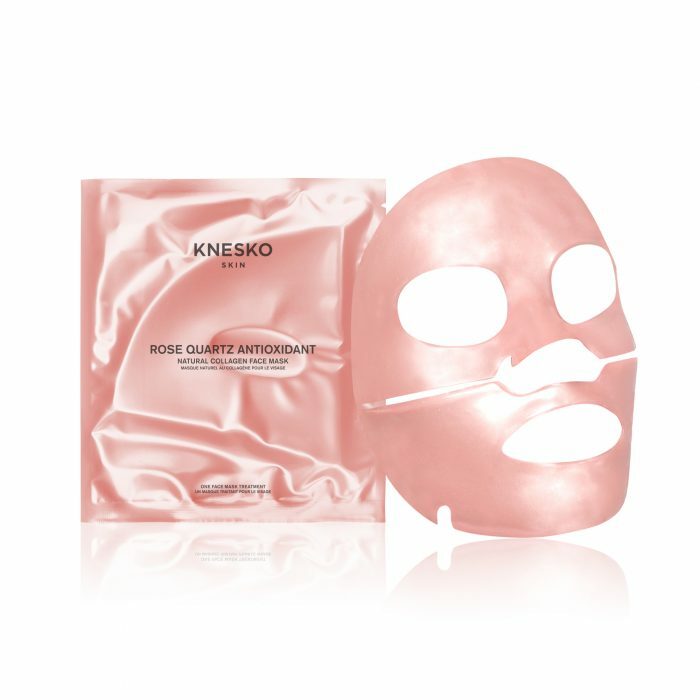 Choose love of spirit and purity of skin with KNESKO’s Rose Quartz Antioxidant face masks. Crafted with revolutionary GEMCLINICAL® technology and charged with Reiki, the healing universal life force energy, each mask in our luxurious 4-treatment bundle offers age-defying, calming skin repair while helping you open your Heart Chakra to self-love and compassion for others. 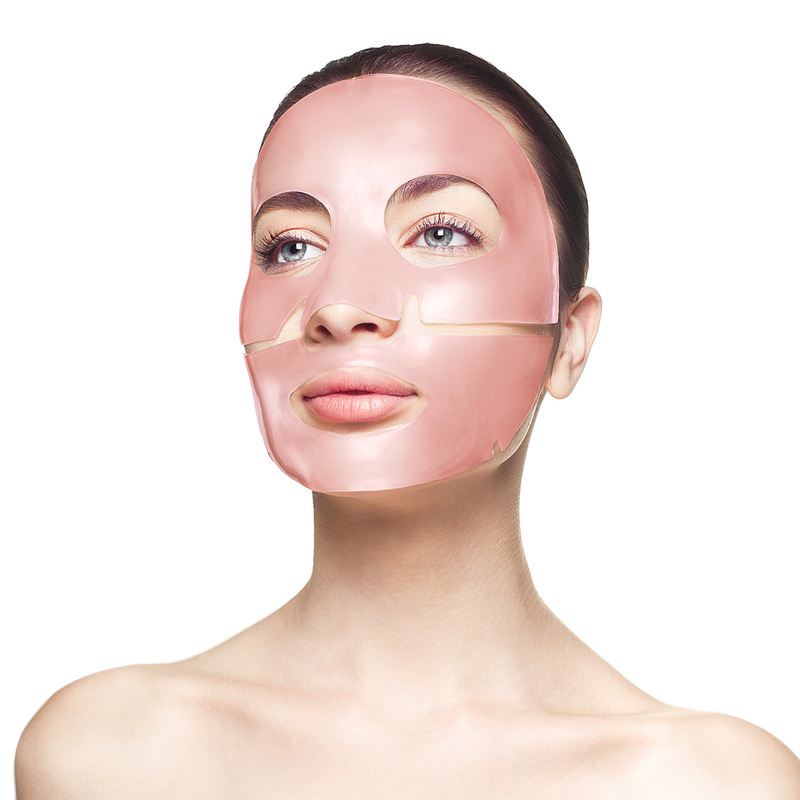 Our rose quartz face masks were lovingly conceived under a team of doctors committed to delivering transformative skincare results by utilizing nature’s most precious gifts. 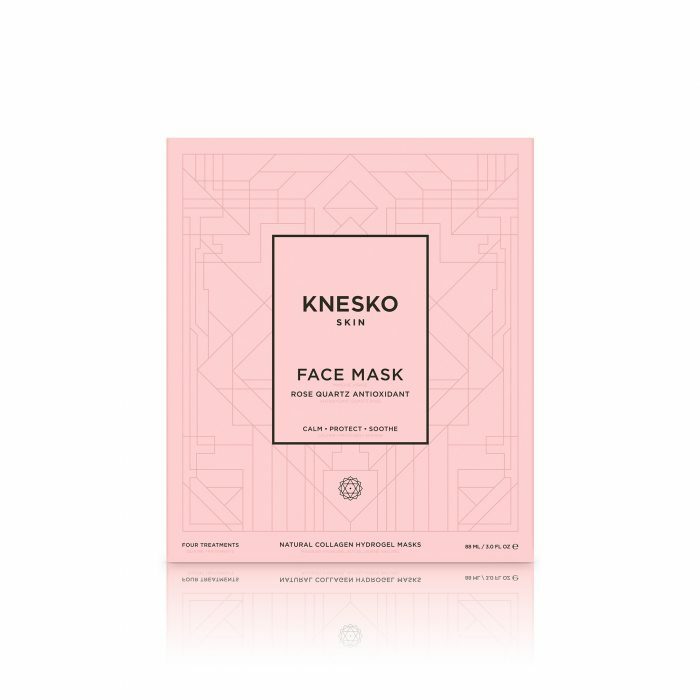 Each time you luxuriate in a rose quartz mask from KNESKO, 1 fluid ounce of rose quartz antioxidant serum works to enhance your inner and outer beauty while five powerful antioxidants such as Vitamin C, Vitamin E, White Tea extract, Licorice Root Extract, and Grape Seed Extract work to protect against and reverse skin damage caused by free radicals in the environment. In addition to this critical protection, every facial mask in the Rose Quartz Antioxidant Collection is made to calm, protect, and soothe both your skin and your heart center at the same time. Other benefits include brightening, hydration, healing, and nourishment. Rose quartz, with its pink hue and gorgeous crystalline features, is the very embodiment of nature’s love. It radiates a very special vibration just by holding it in your hands. Even the ancient Egyptians believed this powerful stone could prevent wrinkles and other signs of aging! And they were right. A beautiful marriage of modern skincare technology and ancient spiritual traditions, our rose quartz masks invoke the power of universal love; the most powerful, beauty-enhancing energy on Earth. Elevate your home skincare regimen with a decadent application of our rose quartz antioxidant serum. Place the mask over your skin and allow it to sit for 20 to 40 minutes while the powerful gemstone helps to remove toxic energies and emotions. As you allow the powerful antioxidants to rejuvenate your skin, repeat your mantra, “I am love” to rebalance your spirit as you relax your mind. Sometimes we forget that our very essence is love. 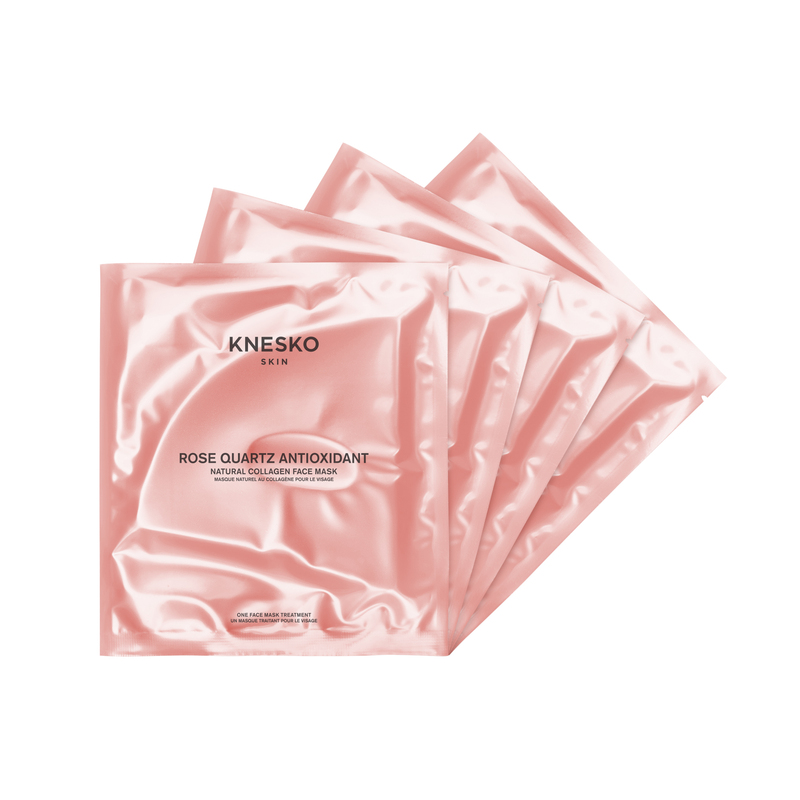 Choose love, environmental protection, and other incredible rose quartz skin care benefits today with KNESKO’s own calming and rejuvenating Rose Quartz facemasks. With one full fluid ounce of rose quartz serum in each mask, a package of 4 collagen masks contains a generous 4 ounces of antioxidant-rich nourishment. 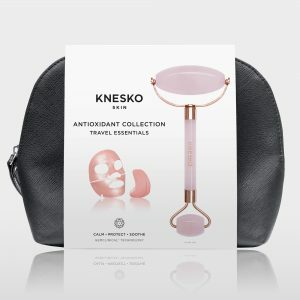 Rose Quartz Antioxidant Face Mask Collection uses GEMCLINICAL® technology which blends the special properties of precious minerals and gemstones with proprietary skincare formulas packed with active and clean ingredients. All the products are then charged with loving, healing Reiki energy promoting a state of total relaxation and well-being. Leave your mask on for 15-30 minutes (20-40 minutes recommended for full face, neck and décolleté treatment) to allow the gemstone-infused serum to work its magic. Take deep, relaxing breaths and repeat your affirmation in a quiet, mindful meditation: I am love. 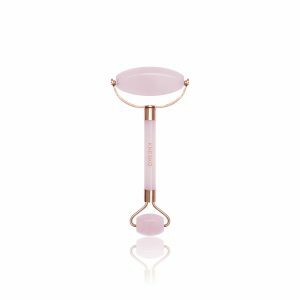 Rose Quartz Antioxidant Face Mask Collection uses GEMCLINICAL®technology which blends the special properties of precious minerals and gemstones with proprietary skincare formulas packed with active and clean ingredients. All the products are then charged with loving, healing Reiki energy promoting a state of total relaxation and well-being.